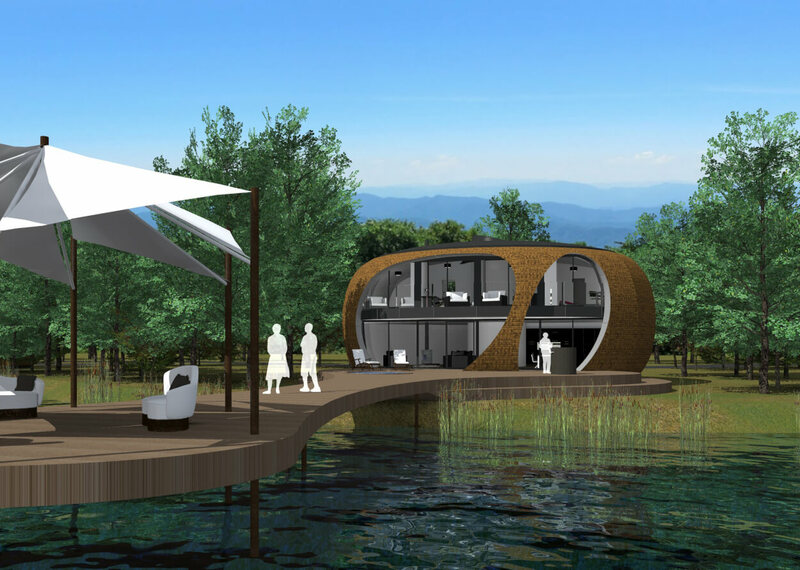 PassivPod began life as a competition entry for a lakeside retreat in the 2014 Sunday Time Eco-Haus competition. Since then, the design has evolved to include several different applications – as a luxury eco-lodge or holiday let, as a school classroom, garden office or as a home (3- or 4-bed options). PassivPod is 100% renewable-powered and designed using the latest passivhaus and biophilic principles, with a gentle visual impact that blends into the landscape. With floor-to-ceiling windows, an organic shape and natural materials, PassivPod adheres to the principles of biophilic design while offering a high-end design aesthetic. The informal organic layout of the development complements an outdoor lifestyle, embracing nature and wildlife. The pod itself will nestle into the landscape, with minimal environmental impact. 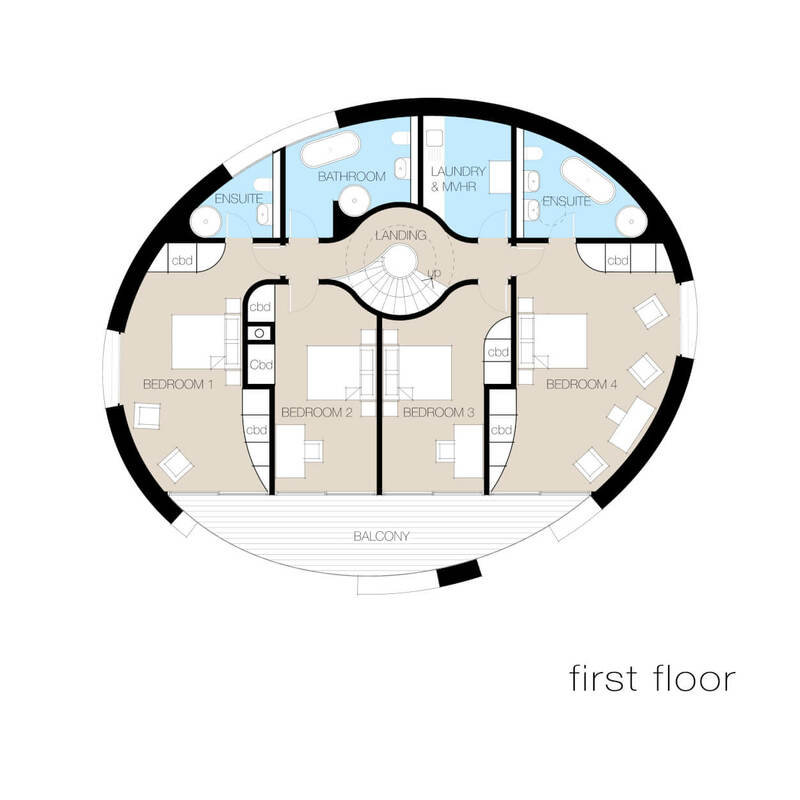 The interiors will be bright, spacious and welcoming, providing a healthy and comfortable living environment in all seasons with exceptionally low running costs. 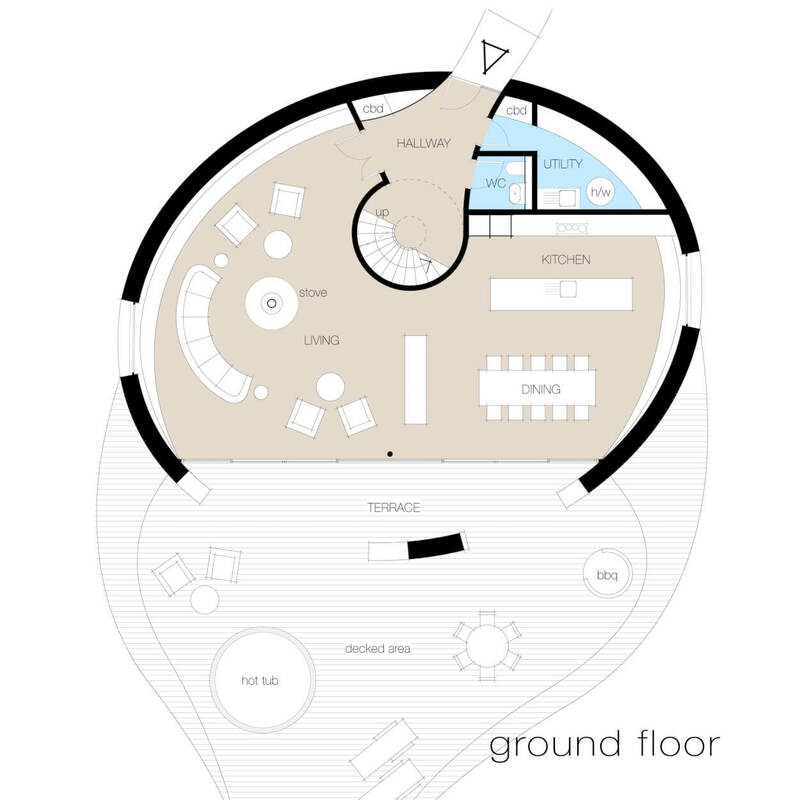 The design is founded on well established ‘Passivhaus’ principles starting with its compact organic form that offers the least surface area for the volume enclosed. The glazing orientation is predominantly south and recessed allowing low-level winter sun to penetrate while excluding the intense summer sun. Bathrooms are located on the north side with minimal glazing and both east and west windows are shaded by external louvres keeping the building comfortable throughout the summer. A roof-lit central stairwell acts as the ‘heart and lungs’ of the PassivPod, bringing daylight down to the entrance area and assisting with summer cooling by providing ventilation and drawing cool night time air through the building. The ground floor living or teaching space is open-plan, loosely divided by furniture to promote sociability and inclusion. The space will enjoy great south facing views and will have direct outside access via a deck area allowing the interior space to merge with the outdoor space. PassivPod components will largely be pre-fabricated off-site in factory conditions where quality can be ensured and wastage minimised. The curved timber frame from base to gutter-line will be a uniform profile replicated around the perimeter and will be stabilised by external sheathing and the timber roof deck and stair core. The foundation will be a reinforced GGBS concrete raft to minimise both ground disturbance and cement use. The external skin will be Western Red Cedar shingles which, as it weathers, will both blend in with and enhance the setting. The roof finish will be a flexible polyolefin membrane and the windows will be timber/aluminium composite framed and triple glazed. To promote a healthy internal environment non-toxic, natural products such as sheep’s wool or hemp insulation will be used and vapour permeability will be ensured providing breathable walls. Airtightness will ensure a draft/condensation-free internal environment which, along with natural paints and finishes, will enhance the wellbeing of the occupants. PassivPod will be the epitome of a low energy, low water consumption dwelling, not only achieving Passivhaus standards, but will also boast a Code for Sustainable Homes level 6 rating. A high efficiency mechanical ventilation system with heat recovery will ventilate the house providing high indoor air quality to all rooms. The PassivPod ‘hybrid’ solar roof will generate 4.2kWp from its flexible solar PV array and a network of pipework directly beneath the roof finish will cool the PV panels and supply heat to a 500 litre thermal store, contributing substantially to the occupants’ domestic hot water demand. A room sealed wood burning stove in the living room will provide supplementary heat in the winter months if needed. A 4,700 litre rainwater harvesting tank will supply the WC cisterns, washing machine and garden hose and, along with low flow fittings, will hugely reduce water consumption. To assist with summer cooling the stairwell rooflight will have automatic actuation triggered by heat sensors. Outdoor facilities will include a hot tub, barbecue and sunken seating, all within the decked area. Each PassivPod will have the option to include a garage pod for two cars, bicycles and storage with a further 1.2kWp roof solar PV array to charge an electric car if desired.